Belagavi district IMA president Dr Suchitra Latkar said that doctors strike will continue across Belagavi district on Wednesday too. Doctors from three district chapters of the Indian Medical Association continued to sit in front of Suvarna Soudha, in Belagavi, in protest of the Karnataka Private Medical Establishment Amendment Bill. Six deaths have been reported in the state for want of medical treatment. Health Minister KR Ramesh Kumar expressed regret over the deaths. As private doctors continued to sit in protest in Belagavi, patients suffered. Most of the private clinics in Belagavi were shut including the pathological labs. Health Minister K R Ramesh Kumar is not ready to make any changes in the proposed amendments to the Karnataka Private Medical Establishment (KPME) Act, as demanded by agitating private medical practitioners. Rajya Sabha member Prabhakar Kore met the doctors on strike and extended his support to them. 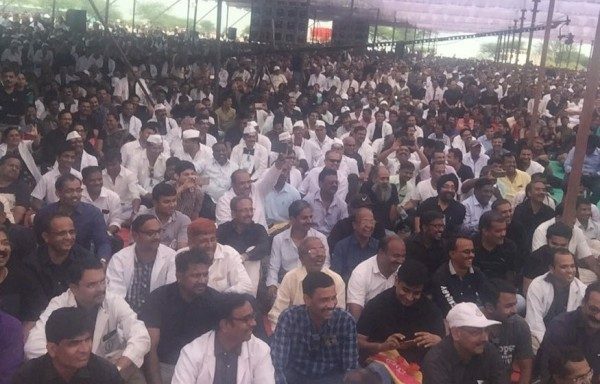 IMA’s Belagavi district president Dr Suchitra Latkar admitted that the strike shouldn’t leave a patient without medical care, but this was the only way to shake up the government to the draconian clauses in the medical practitioners’ bill. Treatment from private doctors. No bill is given. Please introduce so that there is control on them making money. Required as a Swaach Bharat Abhiyaan. Kindly please first know the facts before drawing a conclusion on doctors. This is not a strike which suddenly happen.The health minister was very well informed about this days back n out of arrogance he said that the govt will handle any emergency in govt hospitals. So now it’s for u to think whose the culprit.. No doctor will ever kill a patient. It equally pains us as to What’s happening to patients who are suffering. Instead of abolishing rampant corruption n improving standards of govt health care, they r trying to penalize the doctors who don’t get a single rupee as subsidy for serving the public.. When a doctor purchases land to build or setup his hospital /clinic does anybody give a reduction in price becos we are doing a noble cause?? No never.. Then after investing so much by taking loans n working hard doesn’t the doctor atleast have the liberty to charge for services?? Don’t forget a doctor also has a family to take care off n daily expenses to bear. Just a simple suggestion, if u want treatment from a doctor at subsidized rates, plz provide all facilities to these doctors at subsidized rates. Then u can comment on ethics.. Ultimately the common man suffer because of these strikes. Few months back KSRTC strikes hit for five days. Who suffered? Now deaths are happening. Who is responsible such deaths? Some doctors are looting poor people. Do you agree? For few unethical doctors entire profession has been black marked. Why poor people come to private hospitals? Just with a hope to get saved but they will be looted like anything. How a common man ask ministers? What he is having rights other than to vote? Systems don’t change. Poor people will die. Rich does not have problems. There is no end to this. But Jaisi karni vaisi Bharani. All are accountable in front of almighty. The government needs to weigh in before legislating. Sometimes good intentions can have disastrous implications. Initially, when doctors were brought under legal ambit, it was believed that they shall become accountable, but instead, doctors started practicing defensive diagnosis. For even simple ailments blood, sugar, scans began to be prescribed. The most burdened became the poor and middle class. If all problems could be solved by law we would be in a paradise by now. The whole reason for commercialization is the stupendous money required to get the desired qualification. Merit should be the sole criteria for becoming doctors and then crass commercialization shall die in due course. Since have embraced capitalism in all walks of life, morally difficult to say with straight face that doctors should be the only guys who should be totally ethical. It would be great if the government start cracking down on the government doctors and improve government hospitals where the poorest of the poor go. If someone can afford a private doctor so be it. His/her reputation shall take care of market forces. Strange,, What are they Protesting for???? If these doctors are not doing BUSINESS in the name of HEALTH – then why should they fear with such Govt Bills/Acts. These strikes doubt their sincerity !!! think they have forgotten their Oath taken during their “Medical Graduation”. What is Happening,,,Are they playing with the lives of People. -The aim is to enable the government to regulate private hospitals and prevent patients from becoming victims of medical commercialisation. -Setting up of a district and metropolitan grievance redressal committee to look into the complaints against or lapses on the part of the private hospitals. -The proposed bill mandates private hospitals to first handover the dead body to a family and later collect the dues payable to it.The hospitals will be prohibited from demanding dues before releasing dead bodies. -If the private medical establishments collect more charges than that fixed by the state government it will be liable to pay a penalty of not less than Rs 25,000 and up to Rs 5 lakh and imprisonment not less than six months and up to three years. The Above Key points are not getting down the throat of Private hospitals who in looting common people in the name of HEALTH, hence they are protesting. I Believe, Any Sincere DOCTOR who has the dedication to serve Humanity & People will never do such cheap acts of protesting. If you Doctors cant adhere or cant digest these rules then better shut down your so called Private Clinics/Hospitals and dont worry about Peoples Health. The one who has Created Humans has the ability to HEAL also. But let me pray to almighty God to keep yourself and your family healthy always, but everytime you visit any private doctor or hospital during your lifetime for yourself or your famiyl (which I am sure you will do), I pray to God almighty to remind you everytime, what you had posted about private doctors here..
PS: our own health minister’s, (who is making this KPMEA act) daughter delivered a baby few days back in Bangalore’s top most private hospital..
Let the govt bring the Govt hospital standards to private level (which needed more and more money), I’m sure no one will come to us, and we will shut down our hospitals automatically!! !